UPDATE 2/26/2019--I am in dire need of assistance. I need nearly $6,000 by next Monday, Tuesday at the very latest, to keep my house from going to foreclosure auction March 6, Wednesday. I will be in court Monday and Wednesday, Juvenile Court, Davidson County where I will be attempting to defend myself, pro se, against allegations that Dilara is "dependent and neglected" and I am a perpetrator of psychological harm--see here-- https://www.facebook.com/media/set/?set=a.572320933151961&type=1&l=eeaaec1e0d Oh....I can rant all day on their lies and the way they don't follow the law or rules and they are not supporting my daughter's best interest. If I can reinstate my mortgage, my payments will be lower than most one-bedroom apartments. I can stay close to downtown as I fight to defend the Constitution and also to get my daughter out of court-ordered captivity so she can enjoy relationships with both parents again. 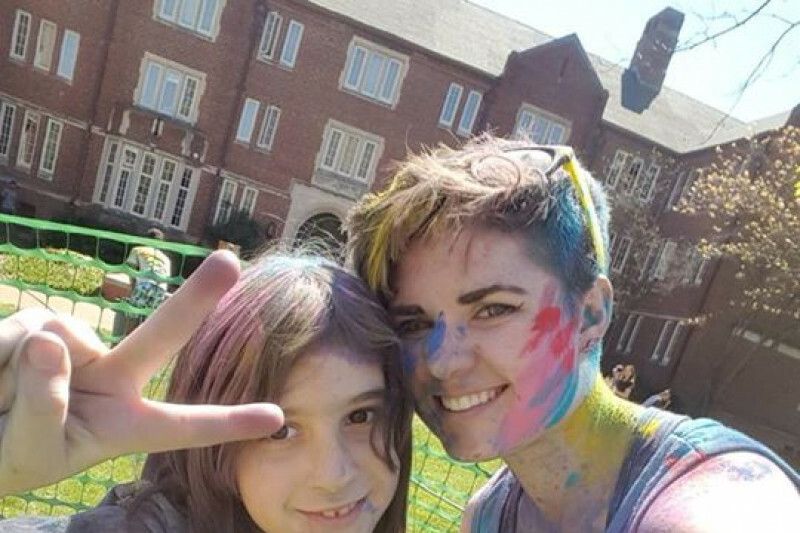 I am keeping this old picture up...The picture is of Dilara and my older daughter (different dads), Callie Hubbell, who is a senior at Vanderbilt, and who has also been cut out of Dilara's life, not by court order, but by Dilara's father. Dilara's brother, Noah, is in his second year at the University of Minnesota, and he is allowed no contact either. My story is long and complicated (they complicate it on purpose), but the short and simple version is that I am an excellent mother, I have never harmed nor endangered any of my children and all of my children did very well when in my primary care. Dilara was enjoying a very stable life until her father was allowed to cut me out. No 10 year old should have to spend years begging to be reunited with family members, and despairing to the point of saying she wants to die and begging people to kill her because she misses me so much. At some point, I might be able to file a civil lawsuit, but all I really want is to be able to pick up the shattered pieces of our lives and help my family heal from this trauma that never should have even started, and wouldn't have if the lawyers, judges, and state and county employees were doing their jobs. My whole case is on the internet. There have been so many lies told about me and erroneous "findings of fact" that I have publicly shared the accusations and the proof that shows that this whole case is malicious abuse of process and civil rights retaliation. I will answer any questions anybody might have to the best of my ability. I have not got all the answers, but I know I am somebody who is fighting a battle most people would not or could not. I can't see this awful truth and turn my head. I have to believe that anybody who understood what I am fighting and how important it is would support me in any way they can. I have had a lot of support, but I need more--financial and otherwise.. And "the system" needs to know that in Tennessee and in America, the average citizen, like me, believes that we all deserve more liberty and justice than we might be able to pay for. If you want to see what they took my daughter from, see www.dilarasnaturestudyandblog.weebly.com or look through my photo albums on my Lydia Hubbell or Lydia A Hubbell facebook pages. Most of my court drama is on the Lydia A Hubbell and I have a lot of "friends" on that profile that are in similar situations as me. I am fighting for judicial accountability and family integrity. If you can't donate, please share with anybody who might appreciate my efforts to defend Liberty and Justice. Freedom really isn't free and my daughter has, at this point, spent a 12 1/2 month period, a 9 1/2 month period, and, now, a 7 month period (which will almost surely be indefinite as long as the judge thinks she can continue to get away with her arbitrary abuse of power) since June 15, 2015. This is all about a father who does not want to share "possession" (as he calls it) of our child. My child is not a trophy. And I only hope she lives through this. 10 year olds can and do commit suicide. Does anyone think that what my daughter is going through is less painful than being bullied in the schoolyard? I don't just need financial help, I need help getting Dilara's story told and I need people complaining and filing formal complaints against these judges and lawyers and state employees. Tell everyone, please. This picture is my brother, Tod Missick, my son Noah Hubbell, me , and my 2 lovely daughters, Dilara Gider and Callie Hubbell. This was on an UNLAWFULLY ORDERED "supervised" visit. Jan. 11, 2018. We are all 100 percent cut out of Dilara's life by Dilara's father. He is Turkish and has NO FAMILY here. Dilara is cut off from her aunts, cousins, grandparents, "old friends" and EVERYONE. Please help me bring an end to this madness. Court-ordered child abuse and other oppression should NEVER be tolerated. Especially not in MY sity and MY state and MY country. Every Nashvillian, Tennessean, and American should be outrated. 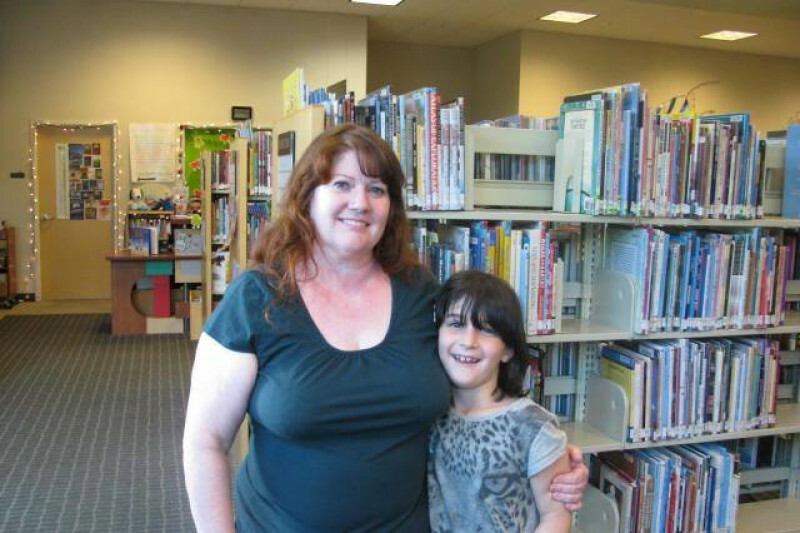 Dilara Gider an 8 year-old second-grader in Nashville, Tennessee is in desperate need of your help. 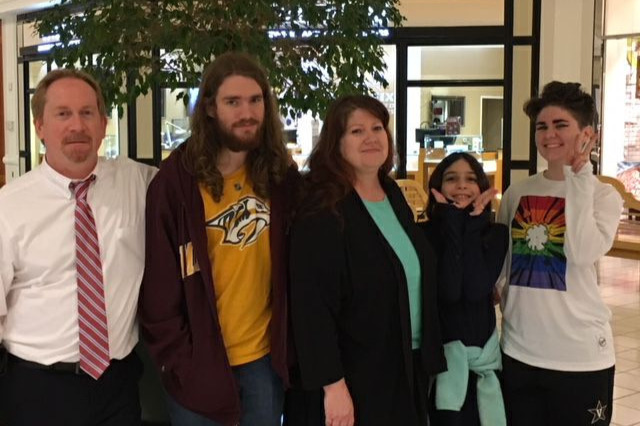 The entire family (Mother Lydia Hubbell, half-sister Callie Hubbell and half-brother Noah Hubbell) has not been together since Mother's Day of 2015 because of abusive misuse of the legal system by Dilara's father and his attorney Sarah Reist, Reist & Maples, Nashville, Tennessee. No, he isn't a monster, he got caught up in a situation he wasn't prepared for and it is likely that he is simply suffering from an adjustment disorder, like Dilara's mother did. She tried for years to get him to get help, like like did, but wasn't interested. People should never hire lawyers when they really need a good therapist. Or Jesus. Dilara's family bears absolutely no ill will towards him. The hope is that the court will correct it's mistake and that he will simply stop going down this wrong road and focus on meeting Dilara's needs and stop attacking Dilara's mother. Dilara has two good parents and she should have equal access to both of them. Details below and email me if you have any questions. PLEASE COMMENT ---SCROLL ALL THE WAY DOWN TO THE BOTTOM OF THIS PAGE TO COMMENT. iF YOU ARE AFRAID OF RETALIATION, MAYBE YOU CAN MAKE AN ANONYMOUS COMMENT, OR i CAN SHARE YOUR COMMENT MYSELF. Who will benefit from this campaign? Immediately, Dilara Gider and her loved ones. A victory over corruption in the family court system is a victory for every parent and child and for every American who values freedom and justice and who believes that children's needs are paramount and the desires of the parents are secondary. This campaign will encourage judicial accountability and family integrity in Nashville, Tennessee, and all over the country. It is true that, "Injustice anywhere is a threat to justice everywhere." Your donation will contribute to the fight against injustice. All funds will go directly for legal expenses to secure Dilara's right to enjoy equal access to both her mother and father, as she did for the first 5 1/2 years of her life until her father decided to cut Dilara off from her mother and the family members, friends, neighbors, pets, church, and other people and experiences that Dilara had been blessed with during her mother's 185 days a year of parenting time. Dilara's mother went from having 185 days of parenting time to zero days of parenting time, which is contrary to all relevant laws and even common sense. It is in the child's best interest and the law requires that Dilara's time with her mother be restored, but it won't happen unless there is a lawyer fighting for justice. Dilara has been damaged emotionally from this court-ordered abuse and has complained to her father, her counselor, and mother (during a few hours of supervised visits) that being cut off from her mother has made her feel worried and sad and angry at her father for keeping her from her mother. She has told him that she "acts bad" at school because she needs her mother. After being cut off from her mother in June of 2015, she has been disruptive and violent, even to the point of breaking her teacher's foot and biting another adult to the point that the skin was broken, and other behavior that led to 6 days of suspension in less than the first six months of this, her second-grade school year. The courts should not be used to create emotionally damaged children who can be expected to grow into emotionally damaged adults without someone intervening to ensure that a child's needs are met. Dilara has explained to her father that she is grumpy and irritable at school because she can't sleep at night because she misses her mom and feels worried and sad and cries in her bed. He has shown that he does not care about her emotional needs, nor about how her "acting out" affects the teachers and classmates at her school. Dilara's mother, Lydia A Hubbell has been fighting for justice for her family for 2 1/2 years and expect the battle to be won within the next few months if she can keep up with the legal fees that the other side has run up by filing frivolous pleadings and rescheduling hearings or striking motions at the last minute, or doing whatever possible to cause delay and run up cost that everyone knows Lydia cannot pay without begging for help from others. Dilara wants what she had before court interference. She wants to have a peace, security, and maximum participation of both parents in her life, and her educational needs met in the best way possible--in a homeschool administered by her mother. Lydia is willing to answer any questions or concerns anyone might have about the merits of her case. Connie was first retained by Dilara's mother several months ago to prevent Dilara's father and his attorney, Sarah Reist, from extending a fraudlently-obtained order of protection that was used to cut Dilara off from all contact with her mother from June 15, 2015 to June 15, 2016 . 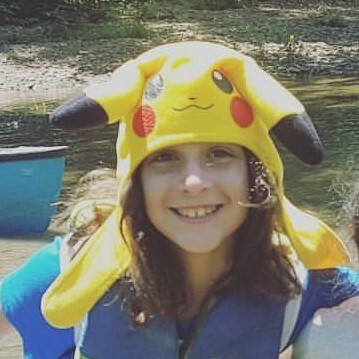 Dilara's mother, Lydia, has appealed the current custody order, but Dilara's father and his attorney, Sarah Reist, have filed a new petition, despite the current order gives Dilara's father 365 days a year of parenting time, and Lydia zero. The purpose of the new petition is to make Lydia's pending appeal moot. This is the kind of abuse of the legal process that needs to be recognized and stopped. Lydia has mostly represented herself in civil court matters as she cannot afford an attorney on her SSDI income. Lydia has several health problems that have left her unable to engage in substantial gainful activity for the past 15 years or so and this fact was one that was used to restrict Dilara's time with her mother. Dilara's father has enormous financial resources in comparison. Lydia, whose professional background and education has primarily been in the field of childcare and who has been a full-time homemaker and mother for the past 19 years, has had no choice but to slog her own way through the family court system to defend her family. Lydia has lost 2 custody trials and a contempt trial (for violating an unlawful gag order by exposing the abuse) in Juvenile Court and unsuccessfully opposed an abusive and fraudulently obtained order of protection in Third Circuit Court, but has 3 appeals pending in the Court of Appeals. The appeals court judges review for error and will set thimgs right eventually. Lydia has also been vindicated in criminal court of false charges by Dilara's father that resulted in Lydia's four arrests in the past 18 months or so. The favorable resolution of all these cases was accomplished only through the zealous representation of Nashville's Public Defenders, Adam Pienciak in particular. The prosecutors don't seem to care if someone is guilty or not, they seem to either want a conviction or a plea bargain, regardless of the facts of the case. The crimnal court system is also unfair to the financially disadvantaged. And perjury seems to never be punished, therefore, it is indulged in on a regular basis, which hurts everyone. Prior to Lydia's experience in the legal system, she was under the false impression that parents had to have harmed their children or done something wrong to lose custody or parenting time and people didn't get arrested unless they had broken a law. There has never been any child abuse or neglect, or any threat to Dilara's well-being while in her Mother's care. The whole court case has been based on lies, misrepresentations and disregard of all relevant fact and law. Dilara wants and needs both of her parents involved in her life to the greatest extent possible, which is what she enjoyed for the first 5 1/2 years of her life until her father asked the court to intervene in her happy and stable life. How helping in this case will help others. This kind of family court corruption is hurting families all over America. You get the justice you can pay for and often the best liar wins. If you don't lie, you have an uphill battle, and if you don't have money for zealous representation, you have almost no chance of prevailing. Lydia has learned that the judges at the trial court level can do anything they want. Even if you win on appeal, before the appeal decision is announced the adversaries can start up a new case and render the appeals decision moot. Every family in America is at risk unless we challenge these abuses of authority and other injustices. Lydia has committed herself to fight to restore and maintain judicial accountability, especially as it relates to children and families. This experience has not left either Dilara nor Lydia unchanged and they both want to prevail over the injustice and to what they can to keep other families from suffering this kind of tragedy. We need to all work together to spread awareness and to force change. We have about 3 weeks to get the public support needed to prevent attorney Sarah Reist Digby from obtaining an order of protection to keep 8 1/2 year old Dilara Gider cut off from her mother for the next 5 years. September 21, a Thursday, is the hearing with Judge Phillip Robinson, Third Circuit Court, Davidson County. I am certain that Judge Phillip Robinson will grant Sarah's request to circumvent the Juvenile Court's custody and visitation order unless there is tremendous public support for Dilara's right to enjoy a close and continuing relationship with me. Judge Robinson cut me 100 percent out of Dilara's life on June 15, 2015 for a year. After that order expired, I had limited contact, while Dilara has continuously asked to be allowed to come home to her mother. This is well documented, but without being able to afford an attorney, and without public support, Judge Robinson will most likely cut me 100 percent out of Dilara's life for the next 5 years. This photo is from FATHER's request to suspend all visitation with Dilara. The courts have ignored Dilara's desires and needs for the past 3 years. YOU can help protect Dilara from further court-induced emotional harm. Donate, speak up, and if possible, show up in court to show your support for Dilara's right to contact her mother. And because they are monitoring this page, you can also post a comment here in support of Dilara, Liberty, and Justice. Please follow my blog at CCJLA.org and tell everyone that they can help #FreeDilaraGider and Dilara needs them to speak out for her. I have not updated in a while. I don't have much new to report. I am updating my facebook page and the facebook group page "Bring Dilara Home" where I have posted many documents related to our case. We continue to be oppressed. Dilara continues to wait as patiently as possible while the wheels of justice slowly turn. I have still been allowed no contact with her, but she has seen some chalked messages I have left with her. We are not giving up. Judge Phillip Robinson totally ignored the law and extended an abusive order of protection, but it does not directly restrict my contact with Dilara. I am waiting to get my copy so I can share it and show how Judge Robinson issued an order that was just like one the Court of Appeals said was unconstitutional. His arrogance is unbelievable. My primary goal is to get our rights restored so that I can meet Dilara's needs and undo some of the harm that has been caused by this court-ordered abuse. My secondary goal is to work to hold the judiciary accountable so that in the future Dilara and other children will be less likely to be harmed by abusive court orders. Please help me bring Dilara home so we can work together to protect other children from court-ordered abuse. 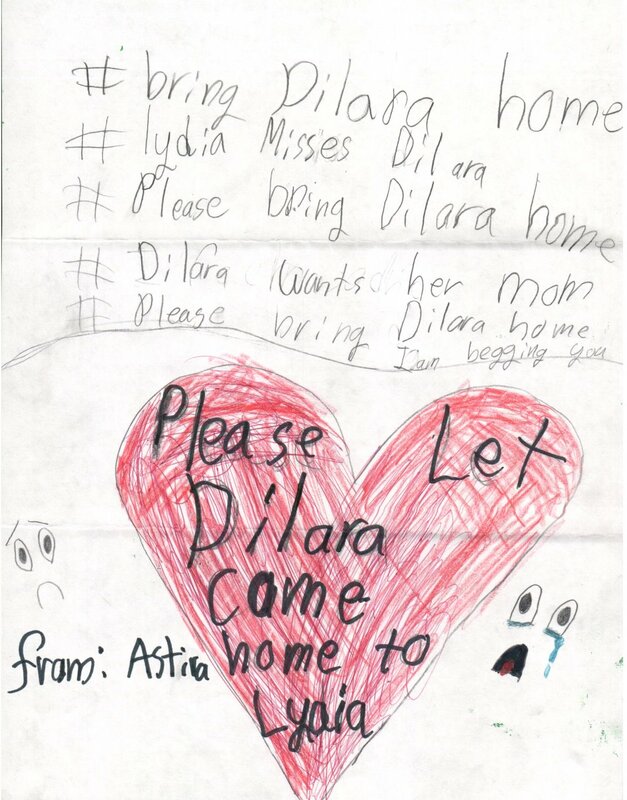 Still no contact with Dilara since Feb. 25. Since all lawyers have to "agree" on who will provide supervision, and since Sarah Reist Digby and her client don't want me to have any contact with Dilara for the rest of our lives, I don't expect to have any contact with Dilara until our trial is over in October. Dilara has continues to ask when she will get to see me, she is still telling others that she loves and misses me (not a chance of alienation!) and she is still frustrated with her father for ignoring her needs. She also continues to engage in disruptive behaviors at summer camp. Nothing in Dilara's life will be significantly better until her needs are acknowledged and met. She is suffering from severe child abuse and neglect, as defined by statute. The legal system is being used to continue to deprive her of what she needs to develop normally and function in her environment. I have no means with which to pay the debt to my attorney. Without her, I would have no hope of ever reconnecting with my daughter until she is 18 and out of the control of her father and the courts. I continue to be thankful that Dilara is able to spend time with her sister on a fairly consistent basis. Court today was awesome! Connie Reguli surprised me by popping in and giving me a little "coaching". I managed to convince Judge Phillip Robinson to give me a fair hearing, but he did not agree to a continuance. 4 hours later, Sarah Reist Digby asked for a continuance and got it because her client had to leave to pick up the child. Sarah is really going to get it. I really expected him to do like he did last year and extend it without giving me a chance to have a meaningful hearing. I have been waiting 2 years to open the eyes of the judge to the fraud that has been perpetrated upon him and how Sarah Reist Digby has made a mockery out of the judicial process and has made a fool out of him. That is what you do when you perpetrate a fraud upon the court, you "fool" them. And it is really, really bad. It should not be tolerated. I think they are used to lying to some extent, but Sarah Reist Digby's lies have caused Judge Phillip Robinson to inflict injustice and emotional trauma on my child that cannot be denied. It is directly attributed to his order of protection and cutting me abruptly out of her life 100% for a year. I did a Facebook live video if you want to watch it. https://www.facebook.com/100011221786486/videos/428203227563733/ PLEASE DONATE IF YOU CAN AND SHARE AND COMMENT IF YOU CAN'T. Removing this child from her loving home is wrong in so many ways. The mother has suffered many injuries from exercising her civil right to freedom of speech. It is impossible to adequately represent yourself against the family court system. Reunification for this mother and daughter is justice. LeAnne,said, "I'm broke myself, but I used my credit card to donate $10.00...I now have a whopping TWO DOLLARS in available credit & glad to have it...it beats being over the limit LOL If I can scrounge up ten bucks to make a difference in a child's life, I know every one can do the same..." She is not the only one to "give till it hurts" to help me in my fight to get Dilara's needs met. So many of us are broke. So many people are in financial need. Thanks to much to all who support me with prayers and encouragement. That satisfies me, but not my lawyer....the corruption is vast and the only way for her to be able to use her talents effectively is if she is paid for the time she spends on a case. I have done everything I know to do to keep my bill as low as possible and I hope that my case will be over soon. This isn't a "bottom less pit" we will keep throwing money into. God bless you im an alienated and maligned parent of now completely brainwashed twin girls. COURTS FASCILITATEF THIS DESTRUCTION! I hope things work out for your family it took me two years of fighting to get my kids home. That same judge did the same thing to my family. We got a reversal 2 months later. He should be stopped. You are correct about criminal court as well. Been there, done that. Prayers for you and your daughter. I have shared and you keep fighting no matter what, I am appalled that her father is using the system to alienate this child. If you can start a FB group page and if possible any supporters to do a rally. Make the public aware do what you can. More that gets out there the more the power diminishes because it is known to the public. They cannot gag you it is against her constitutional right and further more The children are more important. Good luck and wish you the best!! This is one of the reasons why I became an advocate and signed so many petitions. I have gone through this type of thing myself. I tried to protect my children but it has not worked out totally. My first born is still with one of my family members and he is still being hurt by her. It has been some years since the limited guardianship was put into place and I have been up against brick walls trying to get my first born back with me for years and nothing I have done has gotten him back with me and now I am over three hundred miles from my first born. My second child I am lucky in a way to have under a roof with me raising him because me and the dad agreed to fifty fifty custody but at the same time I can not move more than one hundred fifty miles from the dad and most of my family is in the upper peninsula of Michigan and a few of my family members are having dangerous health problems up there and it worries me that if I can not move back up there where I and my youngest son belong fast enough there will not be anything left for me up there because it would be too late. Where I am at right now is actually causing me more stress and mental problems than I was having up there. The only way I can move back upstate without any interference by anybody is if my youngest son's dad dies before me. The dad of my youngest son tried to steal my son from me totally when we were still upstate with the help of one of his family members and a doctor. I will never forgive them for that just like I will never forgive the legal system and my family member who has my first born for stealing him from me. I have pretty much lost hope in ever getting my first born back because of how crooked these people are. I hope that you will be able to have your daughter with you again. Thanks so much for the "nickel and dime" expenses---they sure add up! Praying for you and your daughter. Praying for her father. Praying for parents and grandparents. Michele actually made this donation to help bring Dilara home shortly before I started this campaign to reach out to more people, since I had an arrears and so many people had already helped. It is a whole lot of money from someone who is "just" a friend. None of this expense is necessary, except for lies being told and judge's not doing their jobs. Michelle knows the facts and knows my daughter. Thanks, Michelle! Dilara will thank you herself when she comes home.